Wisdom of Life. : Rejection is unavoidable in selling. The toughest part in selling, especially selling life insurance is rejection. If one has a high rejection tolerance, the chances of succeeding in our challenging business is better. Getting prospects isn't easy. Try asking your friends for some leads, and they would say i am sorry my friends won't like meeting insurance agents. Rejection! Try calling prospects on phone to secure appointment, most would turn you down, after knowing you are from an insurance company. Rejection again! Try making cold calls by visiting house to house, nobody is prepared to open their doors for you. You would be lucky if there is no dog around. Rejection again! Try approaching office to office, the boss would chase you away for disturbing their staffs. More rejection! You might have secured an appointment on phone to meet a new prospect, but on arriving to his place, he isn't there because he has forgotten you. This rejection might break your heart! Good finally there is someone who likes to meet up with you. You conduct a beautiful presentation from A to Z, but at the end he says he prefers to buy insurance from his relative who is also an agent from another company. 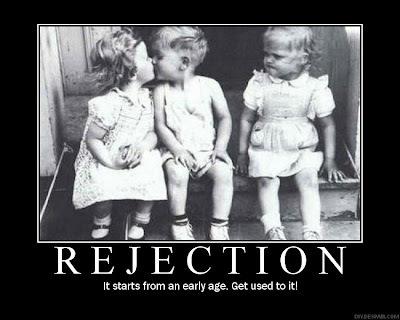 That rejection can kill! So the bottom line is; do you have patience and tolerance? Is your face thick enough to bear those rejections? Can you still smile when you are slapped on the face? Would you be proud to say i am a life insurance agent confidently? As far as i am concerned, i took all these rejections as part of learning in life. In fact each rejection made me stronger and smarter. Today i have learned to play with all these rejections as fun time. Meaning, without those countless rejections of the past, i won't have acquired the experiences of life and to write my wisdom on my blog. To my fellow colleagues in the industry.. to succeed in life we have to accept rejection as part of our selling. When we facing a rejection, is our method going wrong or is our ability weak? That's an intelligent question. Ability and method built confidence. With confidence, most of the time rejection could be overcome.